E.D. Cope received letters from all sorts of people, including one from Charles Darwin’s son Francis, who sought copies of any letters Cope and Darwin might have exchanged. Another of Cope’s correspondents was the German biologist Ernst Haeckel. 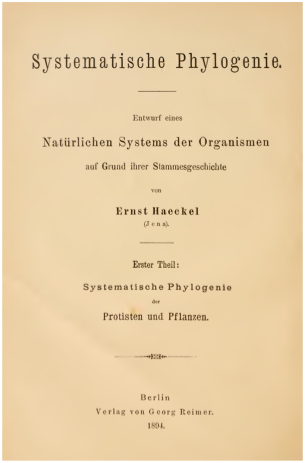 Haeckel is best known for his particular theory of evolution, which combined aspects of Darwinism with German Naturphilosophie and Lamarckian ideas, best known for its central tenet: “ontogeny recapitulates phylogeny.” The development of any individual organism from embryo to maturity recapitulates the evolutionary steps that successive ancestors of the species had reached. Haeckel wrote to Cope in December 1894 asking him to forward along some books to other addresses. Will you be so kind, to send the enclosed books to their adresses [sic]? I hope you have received my „System. Phylogenie”. Regrettably, there is no evidence either of the “enclosed books” nor the “adresses [sic]” to which they were to be sent. Haeckel also mentions his Systematische Phylogonie , one of his more famous works. If Cope had received a copy of Haeckel’s text, there is no evidence of it. It is interesting to note that Haeckel indicated that he had already forwarded a copy of his own book to Cope (or had requested that a copy be forwarded to him) and that Haeckel had received copies of Cope’s “valuable works.” It would be fascinating to see copies of these texts to look for how the two might have read each other’s work. It is also interesting that Haeckel felt comfortable enough with Cope to ask him to send along books to other recipients. Perhaps the two had met during Cope’s years in Europe—he had spent considerable time in Germany during his trip. Haverford Special Collections has a considerable collection of Cope papers. See Edward Drinker Cope Papers. Last fall, as part of Haverford College’s exhibition on things Darwin—“Charles Darwin, Edward Drinker Cope, and the Evolution of the Natural Sciences at Haverford College”—I wrote a panel on Haverford’s most famous evolutionist, the Neo-Lamarckian Edward Drinker Cope. Although he is something of a local hero, Cope seems to have been a jerk (see, for example, this post). Having only a panel made it difficult to capture Cope’s personality, but I think I got pretty close. Edward Drinker Cope never hid his disdain for the rustic life. In 1894 he wrote to Edwin S. Stuart, the Mayor of Philadelphia, to complain about the livestock that farmers were driving down his street. The mayor politely but firmly reminded Cope that “the City Ordinances do not absolutely prohibit the driving of cattle, sheep, swine, etc. through the streets in the built up sections of the City, but as it is such driving is permitted at certain hours.” Four decades earlier Cope had struggled to subvert his father’s efforts to make him into a gentleman farmer. Throughout his career Cope tried to distance himself from the country life and overcome the academic lacuna that separated him from his peers. 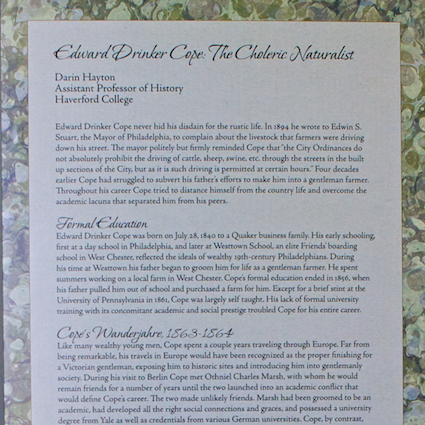 Exhibition Panel on Edward Drinker Cope from Haverford College’s Exhibition on Darwin and Evolution. Edward was born on 28 July 1840 to a wealthy business family. 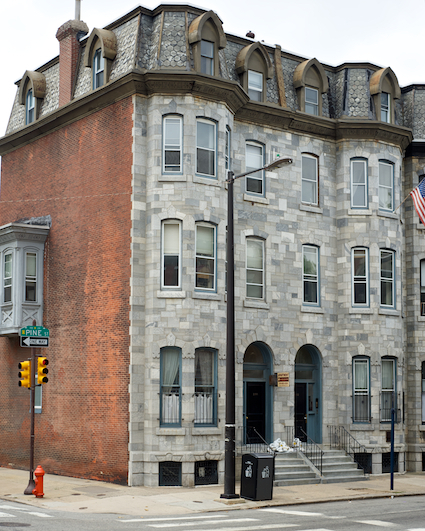 His early schooling first at a day school in Philadelphia and later at Westtown School,an elite Friends’ boarding school in West Chester, reflected the ideals of wealthy 19th-century Philadelphians. During his time at Westtown his father began to groom Edward for life as a gentleman farmer. Edward spent summers working on a local farm in West Chester. Edward’s formal education ended in 1856, when his father pulled him out of school and purchased a farm for him. Except for a brief stint at the University of Pennsylvania in 1861, Edward was largely self taught. His lack of formal university training with its concomitant academic and social prestige troubled Edward for his entire career. Like many wealthy young men, Edward spent a couple years traveling through Europe. Far from being remarkable, his travels in Europe would have been recognized as the proper finishing for a Victorian gentleman, exposing him to historic sights and introducing him into gentlemanly society. During his visit to Berlin Edward met Othniel Charles Marsh, with whom he would remain friends for a number of years until the two launched into an academic conflict that would define Edward’s career. The two made unlikely friends. Marsh had been groomed to be an academic, had developed all the right social connections and graces, and possessed a university degree from Yale as well as credentials from various German universities. Edward, by contrast, had no university degree and, although he had studied with Joseph Leidy for a year at the University of Pennsylvania, he did not benefit from a network of influential academic patrons. Nevertheless, the two exchanged fossils, manuscripts, and photographs for four or five years. When Edward returned from Europe his family helped him secure a position at Haverford College. Edward and his family recognized that he did not have the academic pedigree to teach at Haverford, so through his family’s influence, Haverford College’s Board of Managers granted Edward a Master’s degree to overcome his lack of academic credentials. Edward taught at Haverford for three years. Although he was well paid, he complained that the students required too much time and prevented him from getting his own work done: “They [students] come and want long explanations between school hours which is a pleasure to me to give; it nevertheless consumes time.” In 1867 he resigned from Haverford. The friendship between Edward Cope and Othniel Marsh came to an abrupt end sometime in the late 1860s, when Othniel pointed out that Edward had made a significant error in his reconstruction of the fossil Elasmosaurus: Edward had placed the dinosaur’s head at the end of the tail rather than at the end of the neck. The rivalry between Othniel and Edward continued for the remainder of their lives, each trying to beat the other into print with the latest description and name of a new species or trying to expose errors in the other’s work. Edward’s headlong rush to publish contributed to innumerable careless errors; Othniel’s more careful rebuttals often relied on fossils that he had obtained through bribery and coercion. The two exchanged charges of distortion, fraud, shoddy research, and intellectual poaching. Through most of this contest, Edward worked outside of the academy, doing field work in the American West and working on government-sponsored projects, while Othniel remained in his chair of paleontology at Yale University. This dispute is as much a clash of cultures as a scientific controversy. Edward’s frenetic publishing and brash approach to paleontology reflected his efforts to establish his expertise despite his perceived lack of academic standing. Othniel’s more measured, critical attacks represent the academy’s effort to regulate who is granted intellectual authority. Even in death Edward Drinker Cope contrived of ways to aggrandize his reputation. Thinking himself an ideal model of homo sapiens and scientist, he left his brain and skeleton to the Anthropometric Society. In fact, he turned out to be too small of stature to be used as a physical model. His brain, weighing a mere 1345 grams, fell well below the top twelve heaviest brains, which according to research in 1912 ranged from 2102 to 1636 grams. Edward Drinker Cope was an American paleontologist who helped to establish the Neo-Lamarckian school of evolutionary thought. 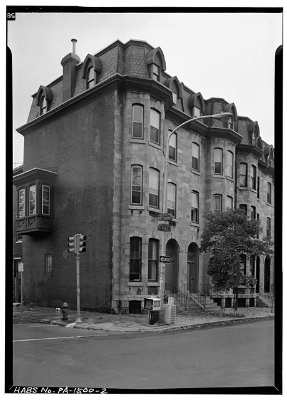 He was also a local Quaker and professor, first at Haverford College from 1864–1867 and then at the University of Pennsylvania in 1891. Cope thought that evolution occurred through changes in embryonic development, not natural selection. Additional stages of development at the end of the embryonic sequence caused speciation. Each new stage was added to the end of the developmental cycle, pushing all previous stages forward in the developmental process. Animals that shared developmental patters were grouped into genera, families, etc. Cope wedded this belief to his Lamarckian ideas, arguing that the parts of an organism that were used the most would develop the furthest, while unused or lesser used parts would degenerate. Diversity in species was caused through changes in the sequence of development of organs based on use or disuse. Similar species would share developmental patterns throughout much of the embryonic stage; distantly related species would differ early in the process. Cope seemed also to believe that you could induce changes through use and disuse of specific organs. Cope along with one-time friend and later rival Othniel Marsh, a paleontologist from Yale University, largely created the first major fossil rush in North America. In the late 1870s the two vied to unearth dinosaur fossils at Garden Park, Colorado, and Como Bluff, Wyoming. Cope published hundreds of papers on dinosaur fossils. 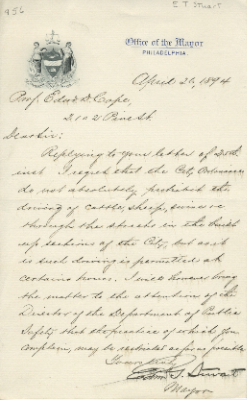 Letter from Philadelphia Mayor Stuart to E.D. Cope. His house still stands at the corner of Pine and 21st. In front of it is a plaque celebrating Cope’s achievements and the years he lived there. 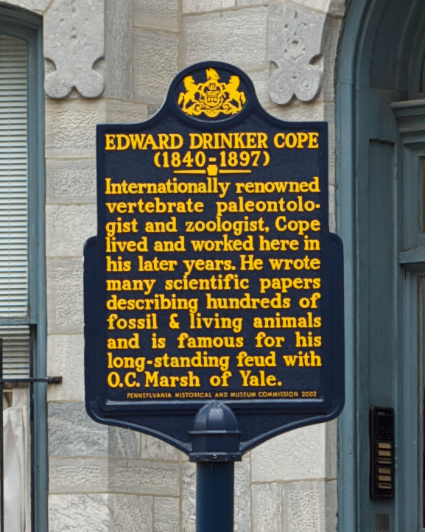 Despite being a difficult man, Cope seems to have been well respected in the fields of paleontology, herpetology, ichthyology, and evolution through Neo-Lamarckian mechanisms. And despite the celebratory and problematic biographies of Cope, of which there are only two, he probably merits some renewed scholarly attention. Brendan Nyhan’s recent piece in the NY Times , When Beliefs and Facts Collide, points out that many people who deny evolution or climate change or some other domain of well-established scientific knowledge show considerable familiarity with the science involved, at least according to his summary of Dan Kahan‘s forthcoming paper, “Climate Science Communication and the Measurement Problem” (see, for example, the posts on Wile’s Exploring Creation with General Science ). These people reject the scientific conclusions and consensus in favor of beliefs. Nyhan hopes for a world in which “factual and scientific evidence” trumps belief. The problem is facts do not occur in some utopian, Baconian world. They do not spring uninterpreted and uninterpretable from the ground. Facts are, instead, heavily burdened with pre-existing ideas. Even recognizing a given phenomenon as a fact requires an interpretative framework within with to make sense of that phenomenon, as Kuhn hammered home 50 years ago. What we accept as a fact and then what we then claim that fact means is always informed by our belief systems and is a marker of our identity, whether we are scientists testing the boundaries of “normal science” or whether we are religious zealots denying Darwinian evolution. Ludwik Fleck, a social constructivist avant la lettre. Although Nyhan suggests as much when he says “With science as with politics, identity often trumps the facts,” he stops short of seeing how even “scientific evidence,” i.e. a fact, is itself a marker of identity and an expression of our values. The deeper problem is not “that citizens participate in public life precisely because they believe the issues at stake relate to their values and ideals;” people cannot act in any other way. There are no value-free facts. 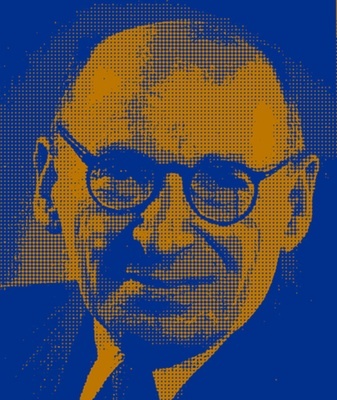 Instead, as Fleck argued 80 years ago, we judge facts from our own personal position—a fact “immediately either makes enemies or friends.” The deeper problem is we fail to recognize that facts are, in the end, impotent. By the time we start arguing about facts, the argument is over.